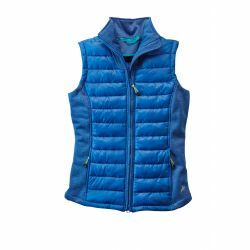 Quilted gilet with chenille lined softshell side panels. Quilted gilet with chenille lined softshell side panels. Coated with a DWR finish to help repel water, dirt and hair. Invisible rear double vents. Contrast zip pulls. 2 way centre front zip. Lower zipped pockets. Reflective.